Learning how to crochet a shrug is not difficult, even for the beginning crochet enthusiast. There are patterns for all levels of experience. A "shrug" is a term used for an article of clothing that is similar to a shawl but often has sleeves or is fastened in front in some way. Generally, it is short, fitting only over the arms and shoulders; this makes it perfect for chilly evenings when a sweater might be too much. 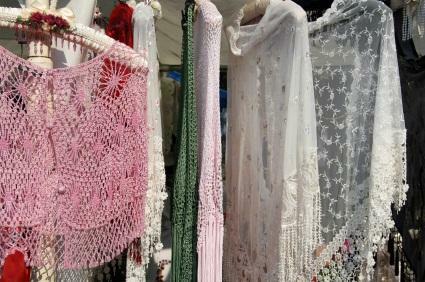 A crochet shrug, in its simplest form, is merely a crocheted rectangle, folded in half lengthwise with the edges sewn together the length of the arms. It is a very quick project, excellent for a new crochet aficionado to move to after scarves. Once you understand the basic shape and have a little more experience, there are all kinds of styles to try. From lacy evening wear to sturdy wool shrugs that look great with your favorite faded jeans, there's a project for you. Numerous stitches can be employed to create endless variations. Of course, there are many more yarn choices. A quick trip to your local craft store should give you plenty to choose from. Make a chain that is large enough to fit around the largest part of your arm. Row one: ch 2, dc in third ch from hook and in each ch across. Chain 2 and turn. Rows two through the next to the last row: dc in each dc across. Chain 2 and turn. Continue this pattern until the shrug is as long as your body from wrist to wrist. Last row: dc in third ch from hook and in each ch across. Finish off. Thread the yarn needle with a long length of thread. Sew the two long sides together for about 14 rows, or the approximate length of your arm. You can add variety to this shrug by edging the cuffs and body opening with a contrasting color of yarn. Coats and Clarks has instructions for this easy, romantic shrug that would be perfect for chilly autumn walks. Here is an easy, casual shrug that is almost a loose sweater and could work with any winter wardrobe. Here is an openwork simple shrug for little girls. For the intermediate crafter, this sophisticated shrug could become a wardrobe staple. An easy, openwork shrug with short sleeves by Bernat will be a versatile addition to any summer wardrobe. Making shrugs may become an addiction, because they are inexpensive, easy, and fun to make. They make great gifts and can be made in children's sizes as well.